Back To Space | Jim Lovell Interview Video! Exciting announcement— new YouTube video from the Back to Space Ambassadors! Some of our interview footage from our interview with Captain Jim Lovell is shown here, where we asked questions submitted by our followers on various social media platforms. 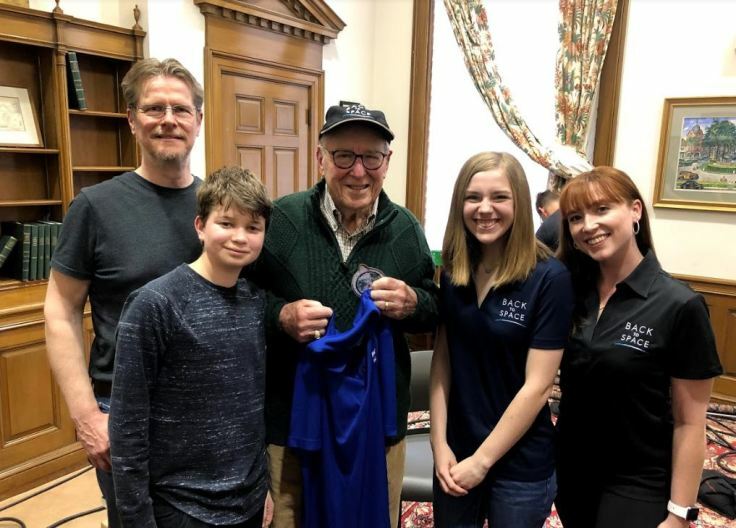 Just to recap— in February, I got to travel from Dallas, Texas to Chicago, Illinois to interview Captain Jim Lovell (and you can read more about it here! Stay tuned for our other videos about this trip.) I came with two books on Captain Lovell, a map of the moon, and three pages’ worth of carefully typed questions. Many had been submitted by our followers on Instagram or by Reddit users especially, and there were so many I wanted to ask. I was surprised by the technical depth some of the questions posed, although I tried to stay away from too many of these. I was also surprised by the simplicity of some— your favorite color or music artist, for instance. I liked these because they were the types of questions it didn’t seem like many people had asked! But I thought that they made Captain Lovell seem more human and more present, a living person with living memories and not a monument to days gone by. That’s the real value of astronauts— passing down the story in a way that machines cannot, with details forgotten and remembered and preserved over time. We live-streamed parts of the interview; when we finished, I learned that there were over 500 views on the video. I was shocked. 500 views! I learned so many new things talking with Captain Lovell, and I was amazed that I got to take others along for the ride. I could only imagine what they learned, how they’d take that knowledge out into their lives, how we would all leave just a little more inspired and excited to achieve. And if that can happen by just one interview with just 500 views, what more can we do? So thank you to everyone who submitted questions— I’m sorry we weren’t able to answer all of them, but I kept my question document and will see if I can touch on some in future interviews with other astronauts. I’m so excited to share the responses for the questions we had time for! We’ve got more of these interviews coming up soon, so if you’ve got questions for astronauts in general or for any particular Apollo astronaut, comment, email, tweet, message on Instagram, Tumblr, or Facebook, or use the hashtag #B2SInterviews and we can try to get it answered! We’ve got all sorts of stuff going on, so if you have an idea or want to get involved, please reach out to us and help us share the stories of the Apollo program and the incredible inspiration of space exploration!